On the days leading up to June 7, 2011, there weren’t a whole lot of things I was anticipating. Life was going on as usual and it was pretty mundane. 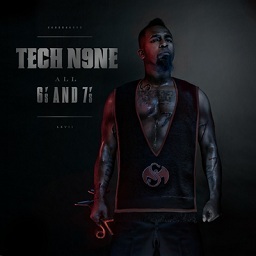 I did although have Tech N9ne’s new album, All 6’s And 7’s, to look forward to. I was really waiting for this album because it was supposed to be Tech’s biggest release, plus it had a lot of mainstream artists on it. Other fans had been going crazy about it, and to be honest, my own excitement was becoming too much to handle. The only question was, where would I buy my copy from? Strange Music had confirmed that there would several exclusives through different retailers. I didn’t give it much thought and figured that I would just get whatever on the day of. That’s where my journey began. On Tuesday morning I had my mom drive me to the closest Best Buy which was still about a thirty minute drive. I was pretty eager the whole drive because I was looking forward to getting the exclusive with the pendant. My mom hadn’t even parked the car before I began getting out and bolted for the door. I quickly walked over to the Rap section and went through all the CDs looking for All 6’s And 7’s. I couldn’t see it at first and I began panicking at the thought them not having it. I walked around to the new releases section and just as relief washed over me, I realized that the bin with All 6’s And 7’s marked on it was empty. “Oh, no..”, I thought. I asked one of the workers if they had the CD in stock, and much to my disappointment he informed me that they had completely sold out of the exclusive album within an hour of opening the store. I was stuck without my Tech N9ne album. Defeated, I headed back home. The only other Best Buy in my area was about a two hour drive and that just wasn’t very feasible at the time. There were no F.Y.E. locations anywhere near me. I didn’t have a place to purchase my All 6’s And 7’s copy. I was admittedly pretty bummed out. Everyone around the country was already listening to the album and talking about it online. A few hours passed before I decided to visit Tech’s Facebook again. I had been avoiding it because I was pretty sick of hearing about the album when I didn’t even have it. Browsing through though, I saw an ad for All 6’s And 7’s on iTunes. I had completely forgotten that the album was even on iTunes! As it turned out, they had an exclusive as well, with 3 bonus tracks and an exclusive behind the scenes video. I couldn’t believe it, I could still get All 6’s And 7’s, plus get my own extras with the album. Without hesitating I went to the iTunes store and bought my Deluxe iTunes Edition of All 6’s And 7’s. It was $14.99, actually cheaper than some of the other stores. I downloaded the album, plus my own exclusives. The songs that came with it were “Eenie Meanie Miny Ho”, “This Is Hip Hop”, and “Ya Killin Me”. I was really surprised when I listened to them and they turned out to be just as good as the songs on the album. “Eenie Meanie Miny Ho” is my favorite of the three, it’s just such a club banger. The video that came with it was even better. It had exclusive footage of Tech working on All 6’s And 7’s, and it wasn’t the same stuff that people got from the F.Y.E. edition. Actually, I think the iTunes video was better. I have never been one to purchase a lot of digital downloads, but if iTunes offers more Strange Music exclusives, I’d probably get more. It was so easy and it was nice to get these awesome exclusives. Considering I couldn’t get All 6’s And 7’s any other way, I’d say iTunes saved me and my Tech N9ne experience!